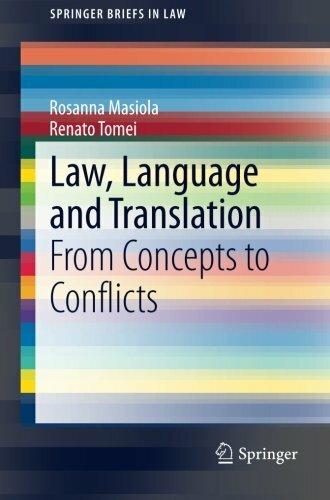 This book is a survey of how law, language and translation overlap with concepts, crimes and conflicts. It is a transdisciplinary survey exploring the dynamics of colonialism and the globalization of crime. Concepts and conflicts are used here to mean ‘conflicting interpretations’ engendering real conflicts. Beginning with theoretical issues and hermeneutics in chapter 2, the study moves on to definitions and applications in chapter 3, introducing cattle stealing as a comparative theme and global case study in chapter 4. Cattle stealing is also known in English as ‘rustling, duffing, raiding, stock theft, lifting and predatorial larceny.’ Crime and punishment are differently perceived depending on cultures and legal systems: ‘Captain Starlight’ was a legendary ‘duffer’; in India ‘lifting’ a sacred cow is a sacrilegious act. Following the globalization of crime, chapter 5 deals with human rights, ethnic cleansing and genocide. International treaties in translation set the scene for two world wars. Introducing ‘unequal treaties’ (e.g. Hong Kong), chapter 6 highlights disasters caused by treaties in translation. Cases feature American Indians (the ‘trail of broken treaties’), Maoris (Treaty of Waitangi) and East Africa (Treaty of Wuchale).